Albuquerque TX ghost town historical marker, photo, Hardin shooting stories. 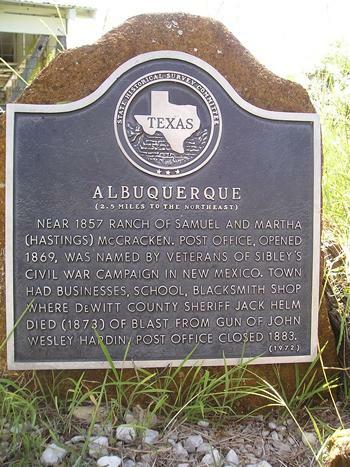 Located on the Clear Fork of Sandies Creek, Albuquerque was once believed to have been in Wilson County. The discrepancy was cleared by a survey in 1914. 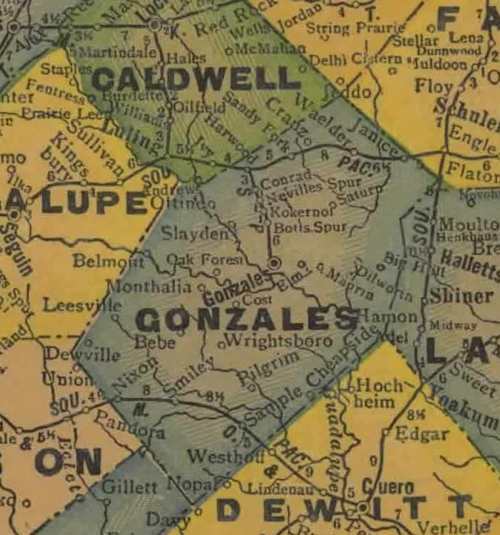 The town was only two miles south of where Gonzales, Wilson, and Guadalupe counties joined. The Handbook of Texas suggests that the name was "probably" suggested by "South Texans who had fought in New Mexico under Henry H. Sibley." Brothers-in-law Henry S. Hastings and Samuel McCracken from Mississippi are regarded as the town's first settlers. The town began in the early 1870s with official recognition coming with the opening of the post office in 1870. Thirteen short years later it was already fading into ghost-town status. The post office closed its doors briefly, reopened and then closed for good in 1883. The fledgling town had the basic businesses to survive including a cotton gin, blacksmith, store, saloon and school, but with no railroad on the horizon, the odds were stacked against Albuquerque's survival. It did have it's fifteen minutes of fame when John Wesley Hardin was involved in not one, but two killings. Albuquerque's decline was attributed to the growth of nearby Union, Texas, aka Union Valley which was two miles south of Albuquerque. Eventually even the die-hard residents abandoned the town and by 1912 the town was totally deserted. 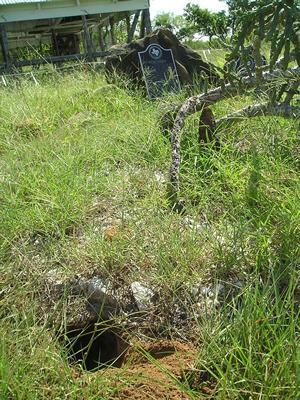 "I have never seen an armadillo hole that big"
"[The first killing] was a Black State Policeman who was under orders to arrest Hardin and "not to treat him gentle." 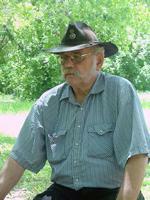 The order had been given by State Police Captain Jack Helms, "who had already been responsible for the murders of several of Hardin's kin." Actually, he shot two [State Police] but only killed one. That shooting took place in a general store on the site of Albuquerque in 1868. By 1873 the State Police had been disbanded. By that time even [Governor] E. J. Davis realized they were nothing but a band of crooks and murderers." "Wes was born in 1853 (which would've made him 15 at the time of the incident). 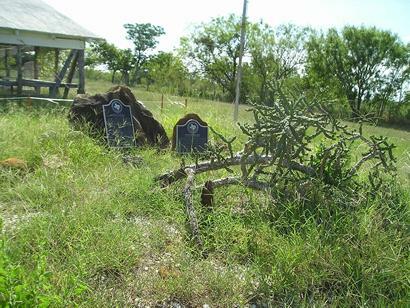 He went on a cattle drive with Manny Clements (whose name was Emanuel, not Manning or Mannen) that spring to get out of Texas for awhile after that [first] shooting." "Actually, Wes didn't shoot Helms. He took credit for it after he went to prison to keep the record of a cousin, who was the actual shooter, clear. When they finally got Helms, Hardin held the town at bay with a sixshooter in each hand while his cousin chased Helms around and around a pot-bellied stove, shooting at him as they went. Believe me, Helms was no loss to the community. Albuquerque had been there a while in '68, but it did die for sure in '83, after it became obvious that it would never get a railroad."